Furutech FI-C15 Gold Slim IEC - $57.99 ea. Furutech FI-C15 NCF Rhod - $84.99 ea. The Furutech FI-C15 slimline IEC is an outstanding connector solution if you own LINN, Devialet McIntosh amplifiers, some subwoofer manufacurers (as well as others), with IEC sockets that are in difficult spots. 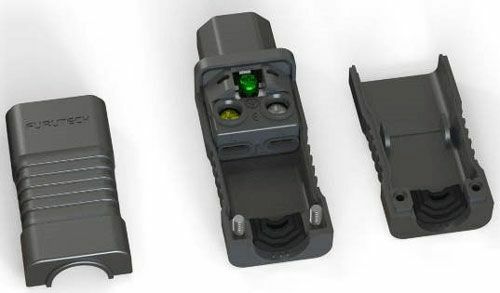 Some components don't have the necessary space to allow conventional aftermarket IEC's to fit. 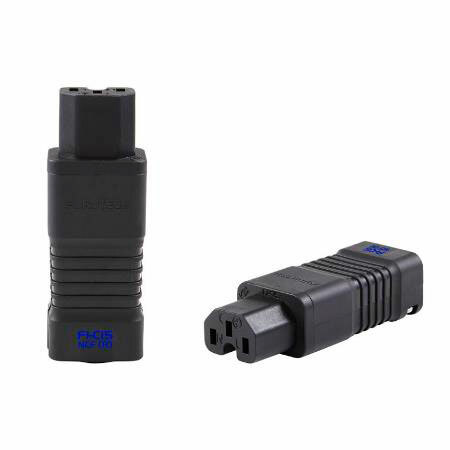 The Furutech FI-C15 high performance IEC connector's slim design will fit those space constrained IEC sockets with ease! Available in two versions: Gold plated copper, or the NCF version which uses Rhodium plating over copper, as well as Furutech's NCF (Nano Crystal Formula). NCF = Nano Crystal² Formula, a Nano Crystalline, Ceramic and Carbon Powder. Incorporated into select Furutech products, Nano Crystal² Formula --- NCF is comprised of a special crystalline material that has two “active” properties. First, it generates negative ions that eliminate static and secondly, it converts thermal energy into far-infrared. Furutech then combines this remarkable crystalline material with nano-sized ceramic particles and carbon powder for their additional “Piezo Effect” damping properties. The resulting Nano Crystal² Formula is the ultimate electrical and mechanical damping material – only found in Furutech products! Nylon / fiberglass (gold version), or Nylon / fiberglass with special “NCF” anti-resonance damping material - nano-sized crystalline, piezo ceramic particles and carbon powder main body and inner cover plate (NCF version). Dimensions: 22.0mm X 30.0mm X 82.2mm overall length.